Solgar Vitamin D 1000 IU is a good choice for people who live where they are unable to get adequate amounts of Vitamin D from the sun. Solgar Vitamin D 1000 IU comes in two forms: softgels and tablets. Both contain 1000 IU of Vitamin D3, also known as Cholecalciferol. Of the three forms of Vitamin D, D3 is the form considered to be the most natural as well as being the most active. Solgar's Vitamin D is derived from fish liver oil. It is recommended that you take one tablet or softgel daily with a meal or as directed by your health care provider. If you are pregnant or nursing a baby, you should consult with your doctor before taking any medications or supplements. As with any supplement, safety should be a consideration. Discuss potential drug interactions with your doctor. Listen to his recommendations when choosing nutritional supplements. There are a few things to keep in mind when you decide to take a Vitamin D supplement. One is that you may not need a supplement at all! There are many other sources of Vitamin D. One of the best sources is the sun. By simply exposing your skin to the sun for 15 minutes, three times a week, you may be able to get all the Vitamin D that you need. If you live in an area that makes regular, limited sun exposure difficult, there are also many foods with Vitamin D that can boost your intake as well. So many foods are fortified today, that with careful planning of your diet you can avoid a Vitamin D deficiency without much effort. Another possibility to keep in mind is that of a Vitamin D overdose. Most people who enjoy a varied diet along with a bit of time in the sun can do with out Solgar's 1000 IU of Vitamin D. In many cases, 400 IU is sufficient. However, it has been found that Vitamin D deficiency is more common than once thought.If your health care provider feels that you need 1000 IU of Vitamin D each day, it is due to a severe deficiency. What this does not mean is that more is better. It is quite the contrary actually. Taking more than 1000 IU daily can lead to a reduction in bone mass as well as other problems. It is also a good idea to take calcium with Vitamin D because they work together to keep your bones strong. Choosing supplements from Solgar is a great idea. Solgar has been around since 1947. They know their vitamins! Currently they offer over 450 products including vitamins, minerals, herbs and specialty formulas. Their world headquarters in Leonia, New Jersey also has on site quality assurance so that all of Solgar's products are the highest quality possible. Solgar offers products that are vegetarian and/or Kosher certified. They contain no unnecessary sugars, starches, salt or fillers. They are also gluten-free. 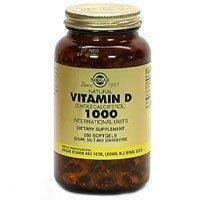 If you are interested in trying out Solgar Vitamin D 1000 IU, there are many places you can find it. With sales in over 40 countries, Solgar is a well known and trusted company with products found almost everywhere. However, if you need a little help, you can try the store locator on the Solgar web site to find a store near you that carries Solgar products. There are also numerous online sources including Amazon, The Vitamin Shoppe, Vitamin Express and more.